Patterned Panacea: The patterns here have been generated by Streptomyces, a beguiling species of bacteria. Natural inhabitants of rich forest soils, they emit aroma molecules, and are largely responsible for the intoxicating smell of woodlands in autumn. I like to think of them as the wise old men of microbiology as they have a very complex biochemistry and produce the majority of antibiotics used in human and veterinary medicine and also anti-tumour and anti-parasitic agents, herbicides, and many other active compounds. 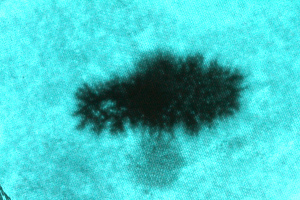 As a consequence, of this, the textile has unique curative properties. As before the bacteria are inoculated onto the textile and then allowed to grow. After 48 hours they have grown with the inherent properties of the bacteria dictating the eventual design. In this example the texture of the design is more akin to velvet (think flock wall paper) as the bacteria are filamentous in nature. In addition these bacteria are not motile so the patterns form only where they are inoculated. Another remarkable feature of this textile, is that it possesses the intimate aroma of rich woodland soil. BioSuede: Taking inspiration, from scientists at the Institute for Chemical and Bio-Engineering in Zurich, myself and artist Ninela Ivanova, isolated the moulds from Camembert, Stilton and Roquefort and simply cultured them on the surface of milk to make these remarkable textiles which are essentially a living fungal biofilm. The materials have the appearance of suede but are strongly hydrophobic, that is, they strongly repel water, which if applied to textile forms small beads and simply rolls off. A microbiological and sustainable version of GortexTM, may be just around the corner. Patterned Petrichor: The living designs here are generated by species of a bacterium called Streptomyces. These are ubiquitous inhabitants of soils, where they play a vital role in degradation and recycling of decaying natural material. They also adept at manipulating human senses, as they emit a compound called geosmin, that is largely responsible for the intoxicating smell of woodlands in autumn and petrichor, the distinctive and beguiling aroma that accompanies the first heavy rain after a dry spell. 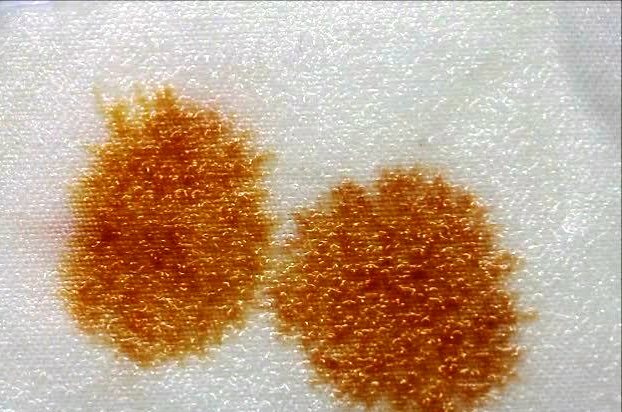 This is a test for a conceptual textile, with a pretty living design, that would be used in curtains that would also generate natural aromas for the home, that would replace the brash and overpowering synthetic scent of air fresheners, with the natural perfume of autumn woodlands and petrichor. 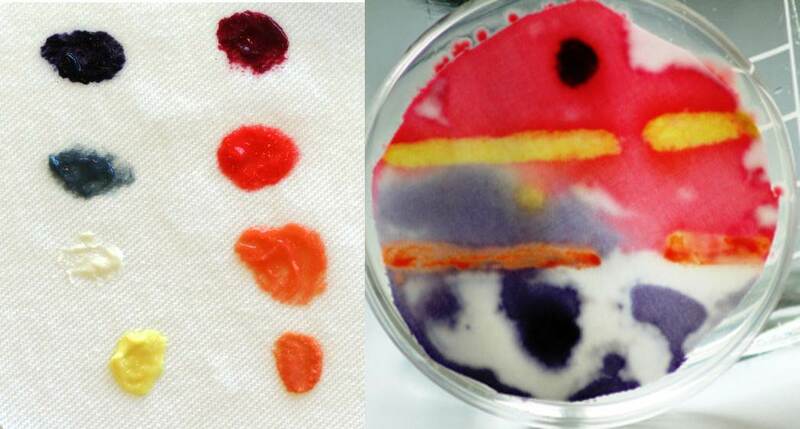 Biogenic Design II: These are examples from a series of works featuring purely biogenic designs, which explore the inherent creativity of, and which use nature, to directly generate textile designs.These living designs on cotton are made by the interaction of two species of naturally pigmented bacteria, Serratia marcescens (red) and Chromobacterium violaceum (purple). In the first instance, the bacteria are inoculated onto the textile in small quantities and then allowed to grow. After 12 hours incubation, the movement of the bacteria (they are motile and move with purpose), their growth, and their interaction with each other, has given rise to a unique pattern. The design arises entirely from the inherent properties of the two species of bacteria and here it is clear that Serratia marcescens is more “aggressive”, than Chromobacterium violaceum, and has out flanked it, corralled it, and thereby limited its spread. 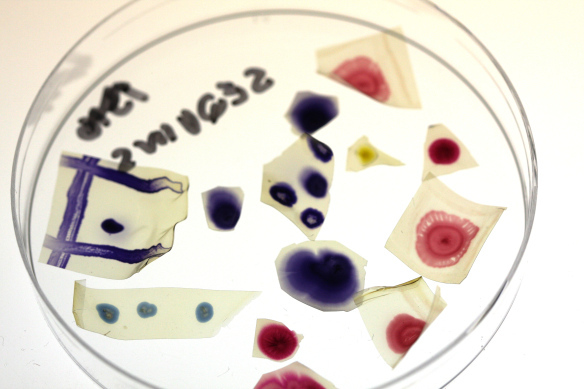 BioSequins: Bacteria are grown in the lab on media containing nutrients and water, which is converted into a firm gel by the addition of agar. The media feels quite solid to the touch and provides a good surface for bacterial growth despite comprising 98.5% water. When this water is carefully removed, the agar and the bacteria form a thin transparent film in which the agar has become a glassy state and the bacteria embedded within it forming a novel bio-crystalline state. These forms retain the essence of the originating bacteria, but as they are inactivated by the process, they are safe, and make ideal embellishments as BioSequins for BioArt dresses. 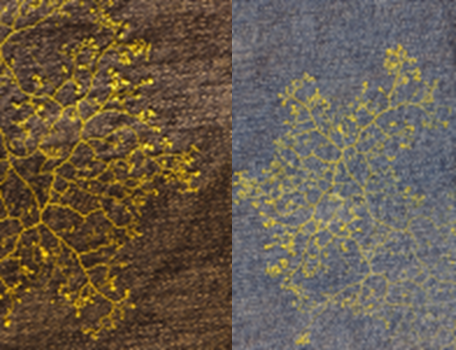 The Sensitive Cloth: a novel textile impregnated with living bioluminescent bacteria. Not only can the textile be used to make a beguiling bioluminescent dress that glows in the dark, but as living bacterial cells emit light and dead ones do not, the material also provides a unique and rapid real-time monitor of antibiotic activity. It could conceivably, be used as an aesthetically interesting and rapid screen for new antibiotics. 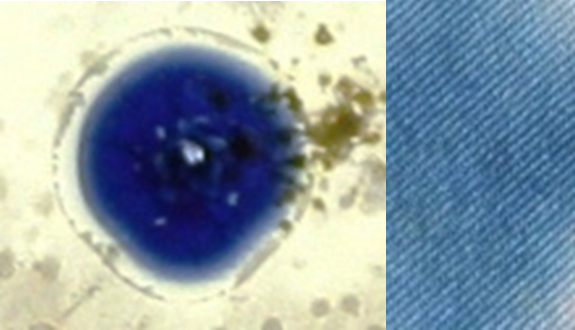 Bacterial Indigo: Indigo, the dye used to stain jeans blue, was traditionally extracted from plants of the genus Indigofera. Today, however, the several thousand tons of indigo used each year is synthetic and produced by industrial processes with obvious consequences for the environment. This is a project which seeks to develop a sustainable form of indigo using the bacterium Vogesella indigofera. This rare blue naturally pigmented bacterium was originally isolated from a pond that had been used as a dump for highly toxic chemical waste and I find it intriguing that something so beautiful could arise from such a polluted environment. 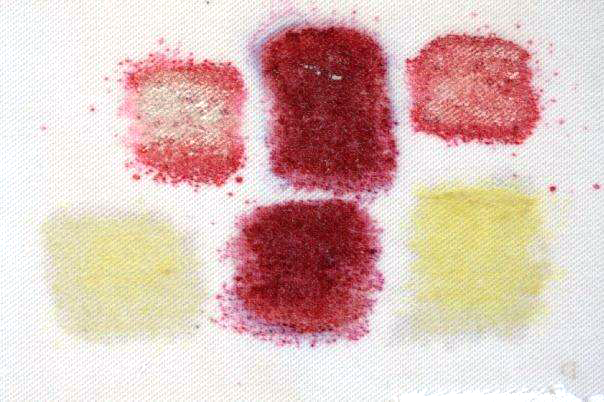 BioDyes: How often do we think about the origin of the dyes used to colour our clothing. Almost, without exception they are, synthetic, and also the products of unsustainable chemical processes. 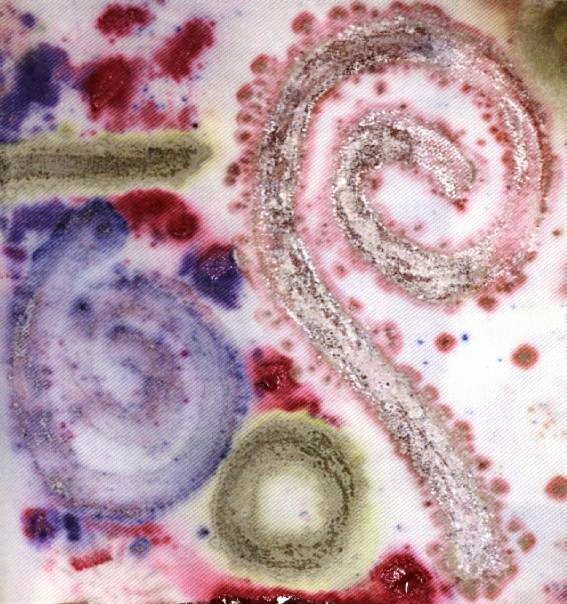 This brightly coloured design on cotton is made entirely from naturally pigmented bacteria. It is natural, sustainable and also alive. 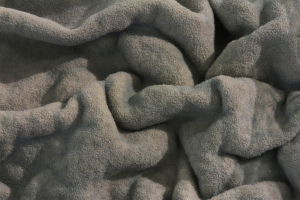 A collection of my BioTextile experiments and concepts all in one place! The closest thing I have got to this is the black-brown stain left by mould on my damp silk dye bundles… Intriguing, thanks for this! If the bacteria is alive – how do you clean the fabric? Or, does the colour die with the bacteria? Too many questions.